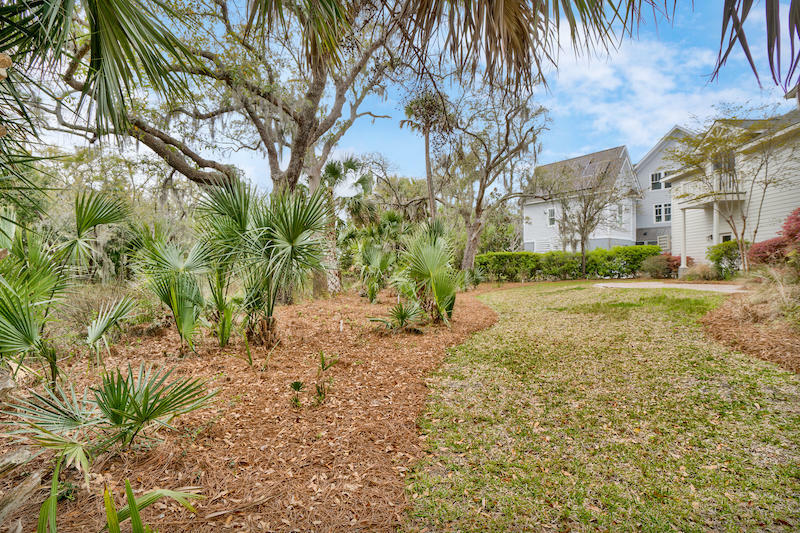 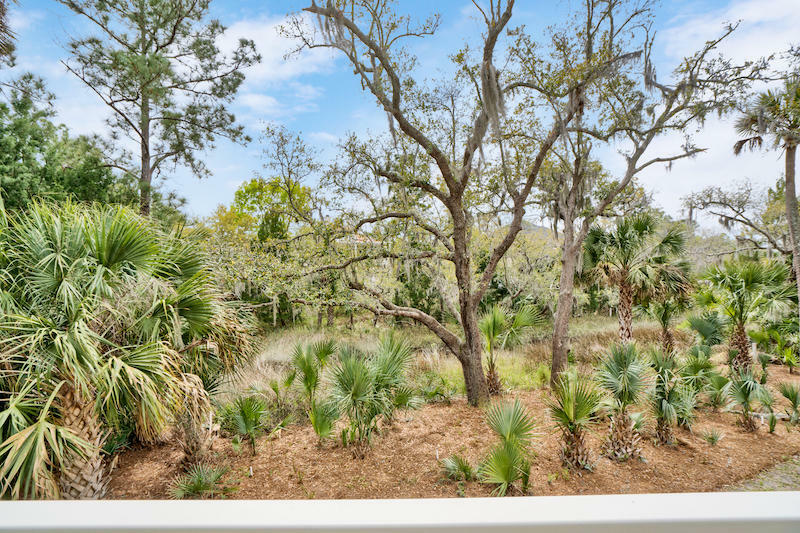 Daniel Island Park's hidden gem has been professionally designed and renovated into a modern coastal masterpiece. 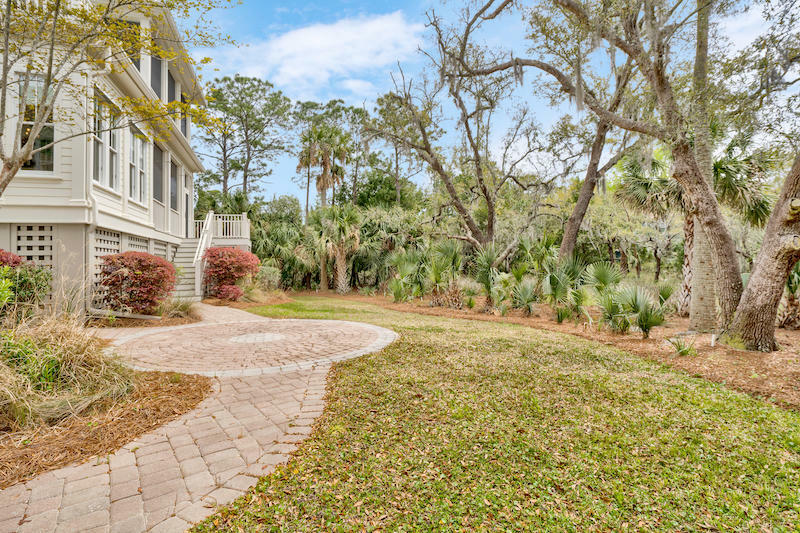 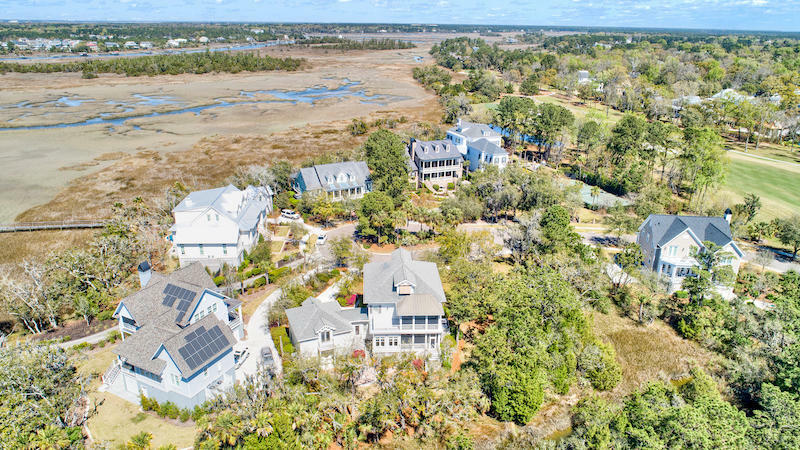 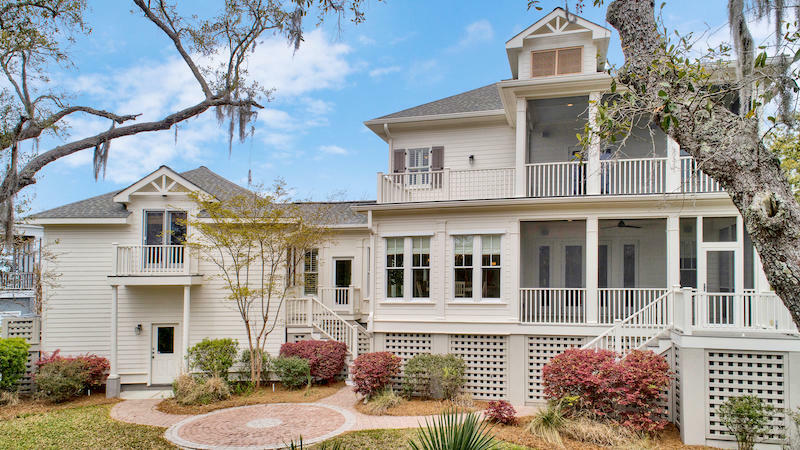 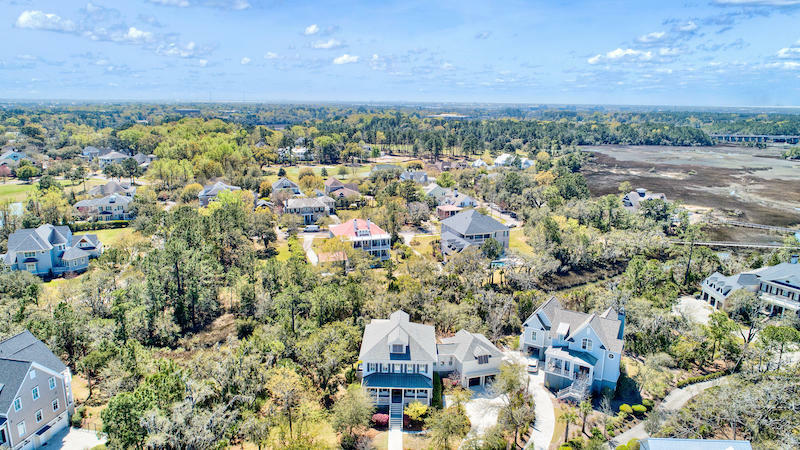 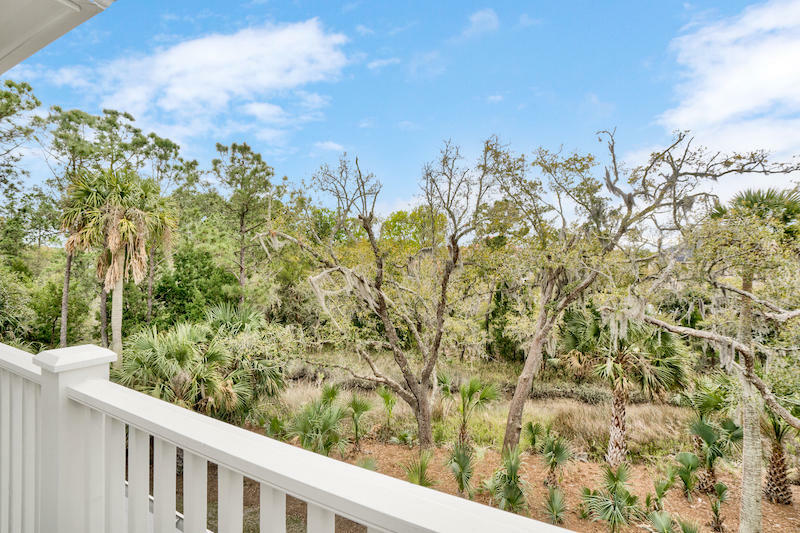 This custom-built residence sits on .54 acres, one of the largest lots on Daniel Island, and has panoramic tidal marsh and creek views. 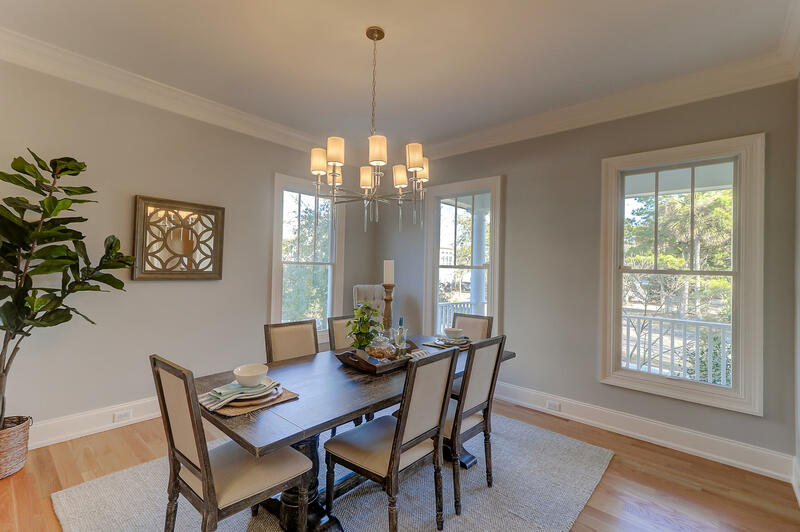 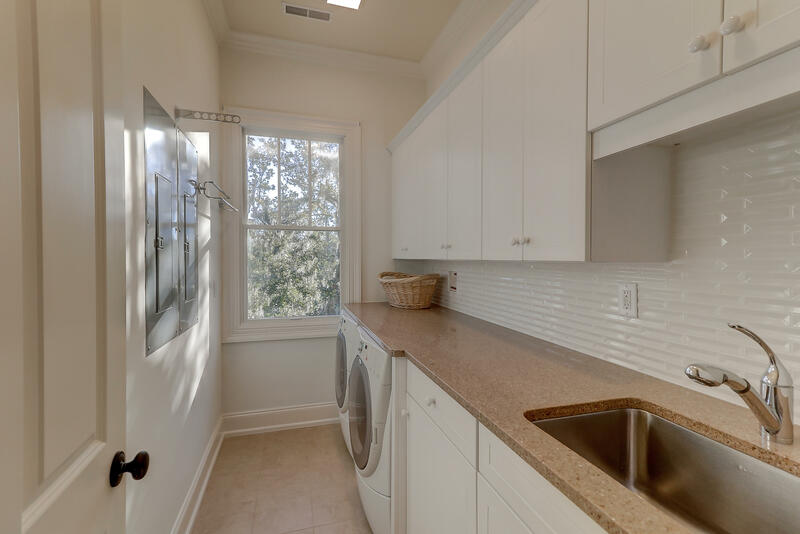 This rare location is nestled back on a quaint cul-de-sac lined with beautiful mature trees. 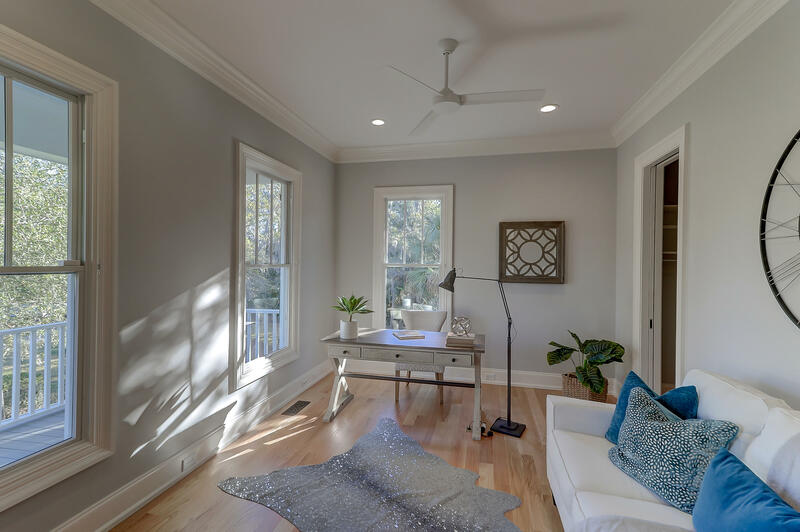 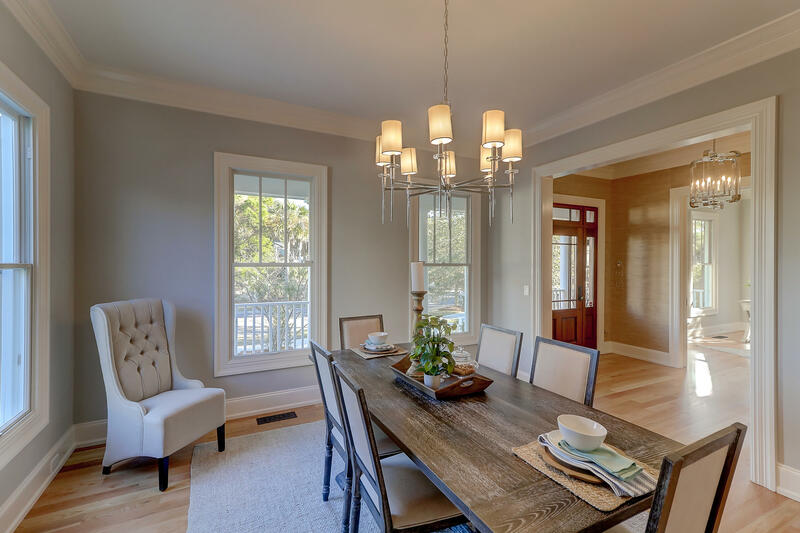 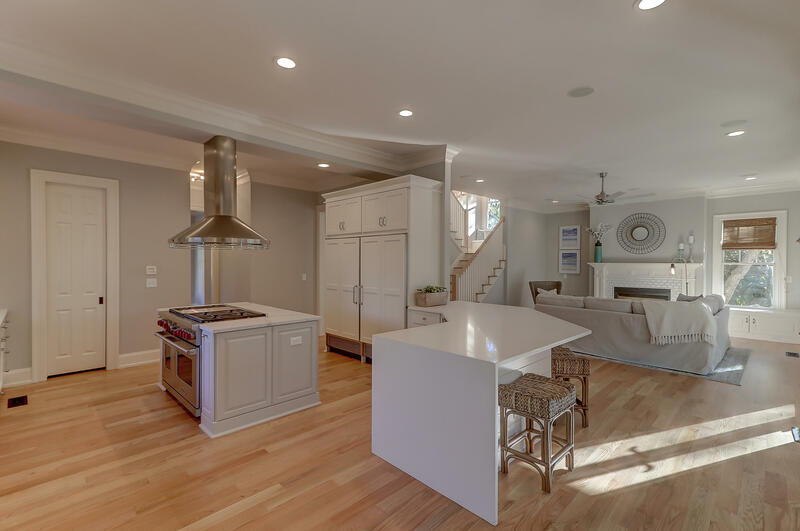 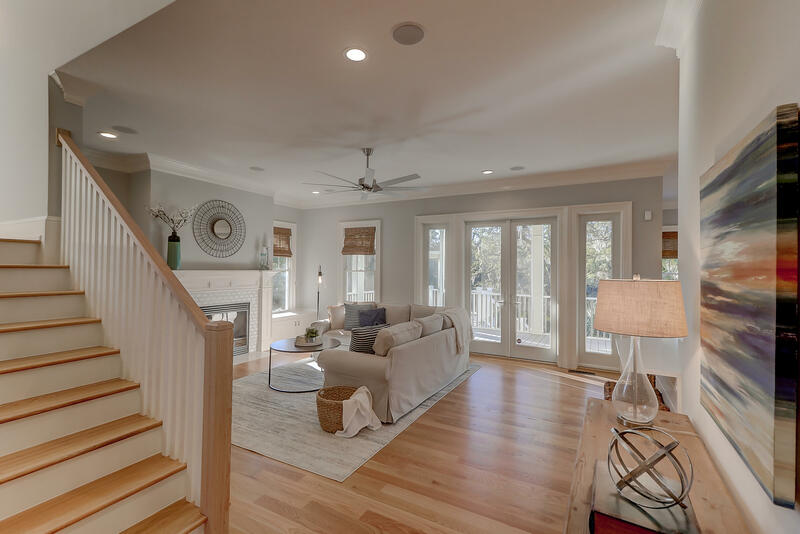 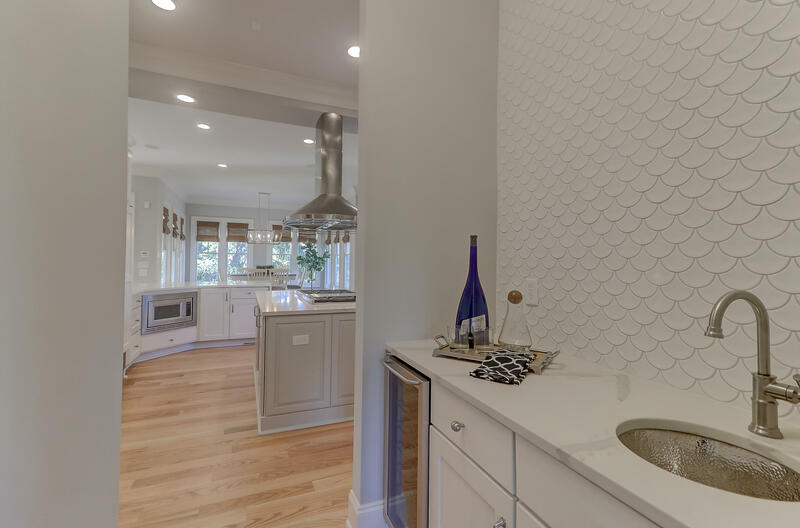 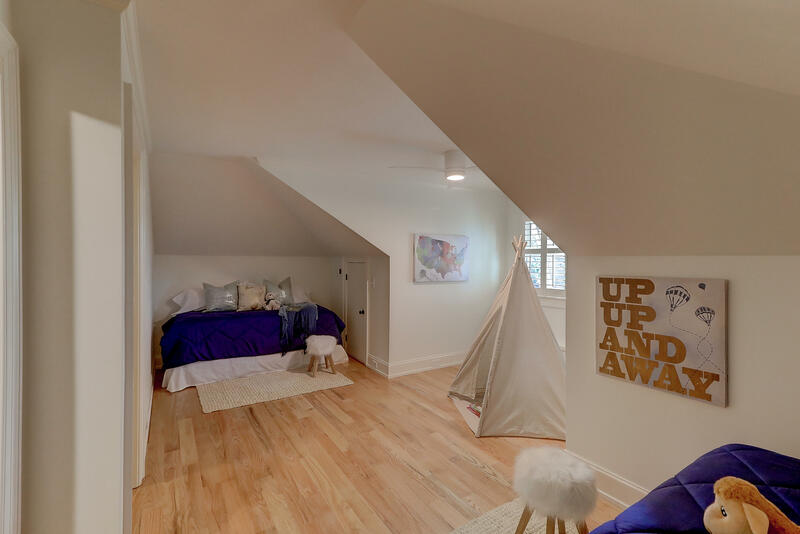 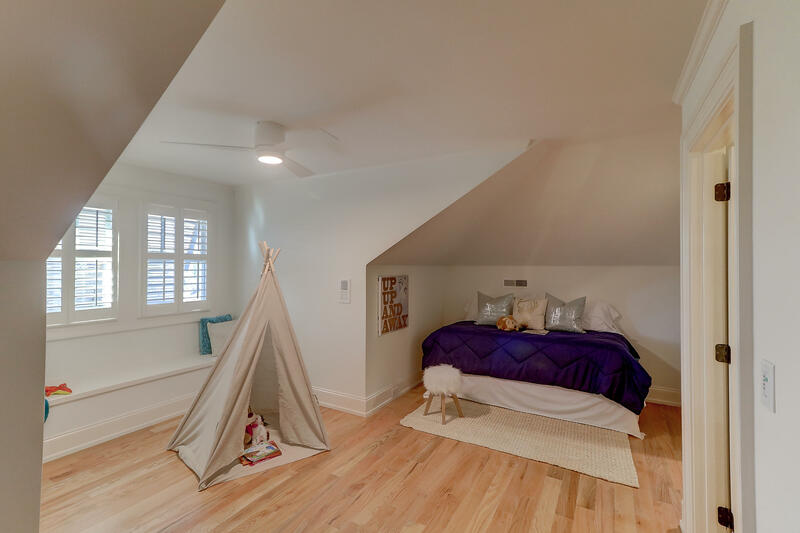 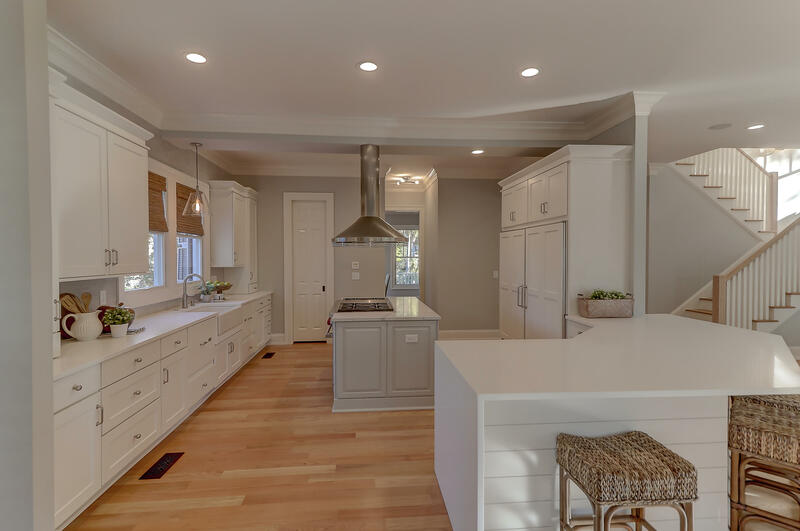 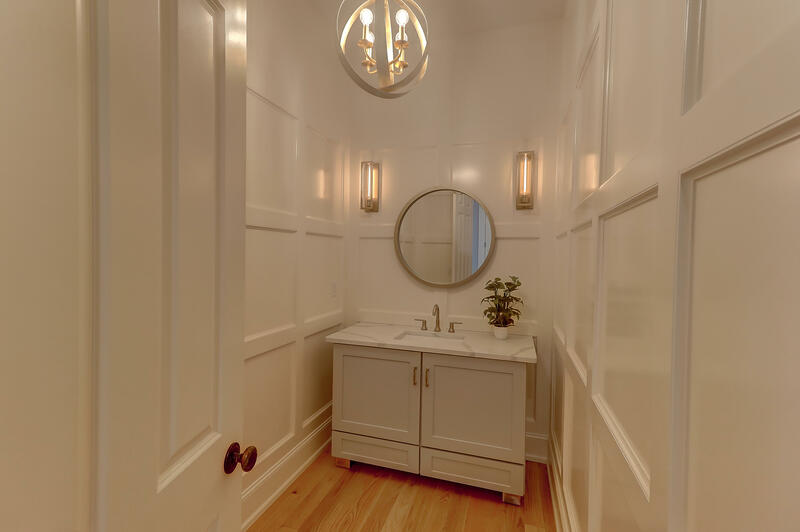 The interior design team spared no expense with stunning details including wallpaper, shiplap accents, quartz countertops and modern lighting. 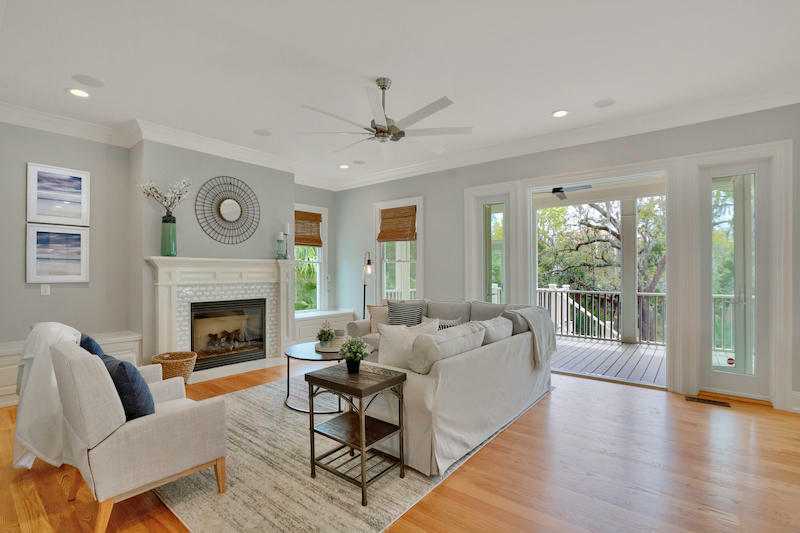 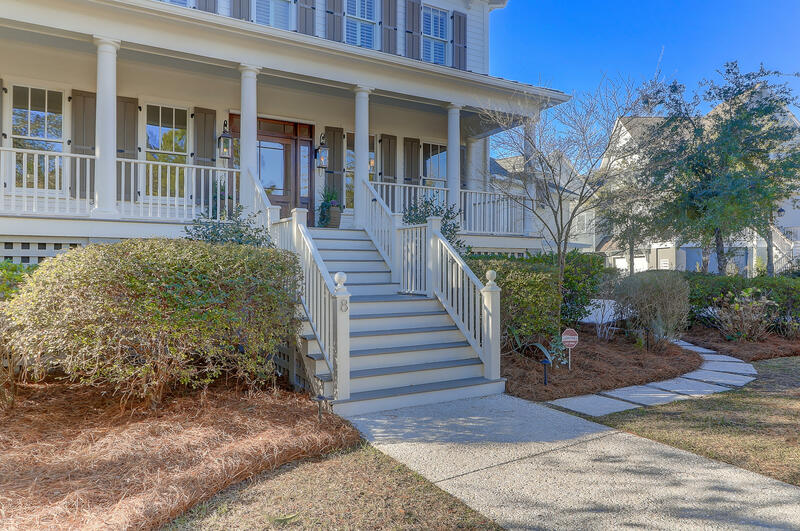 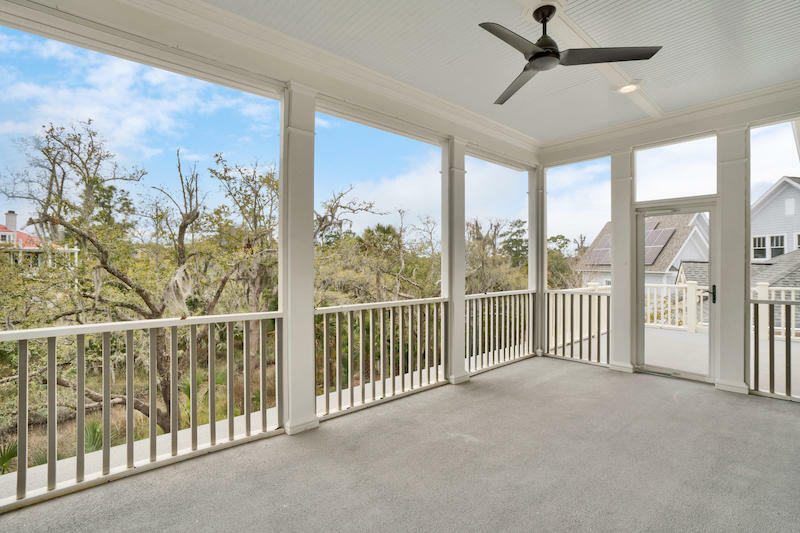 The full front porch of this elevated home opens to an expansive open floor plan. 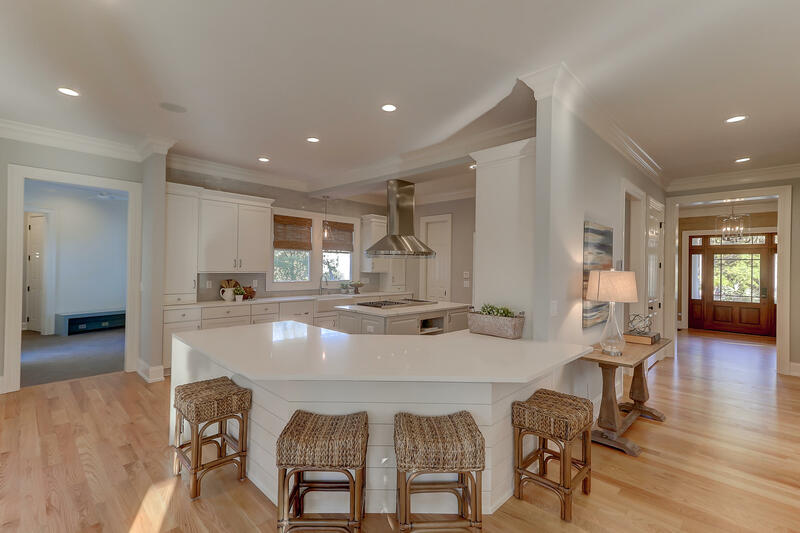 There is a main floor office, a formal dining room which opens to the butlers pantry with Scotsman wine cooler and a gourmet kitchen. 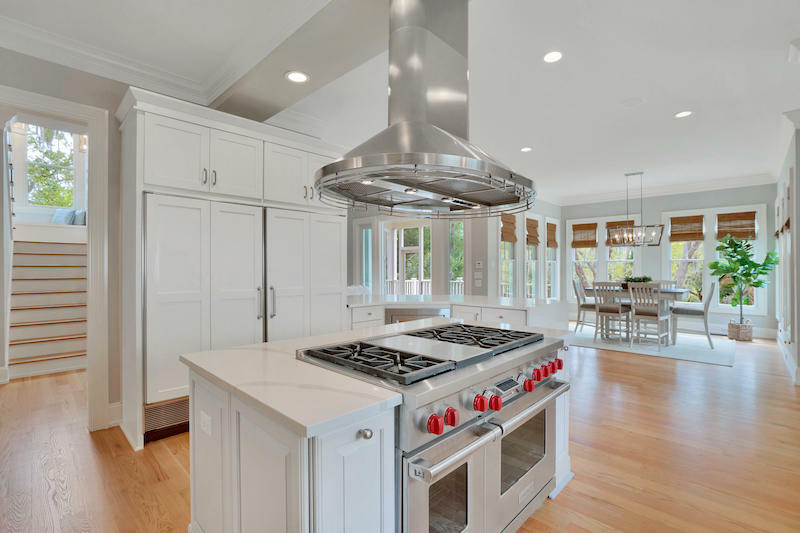 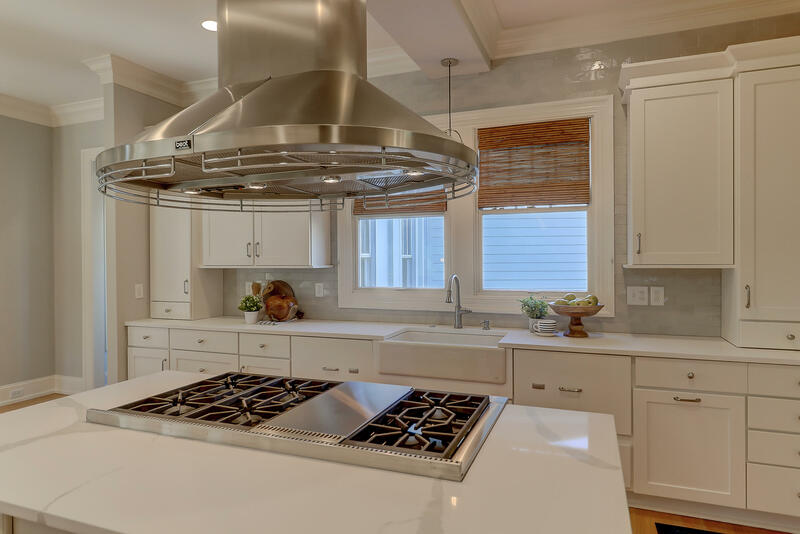 The kitchen glows with white solid wood cabinetry, Sub-Zero refrigerator and freezer units, Wolf 6-burner Stove with a stainless hood, two Wolf ovens and griddle, two Fisher Paykel dishwasher drawers, a beautifully tiled backsplash and a farmhouse sink. 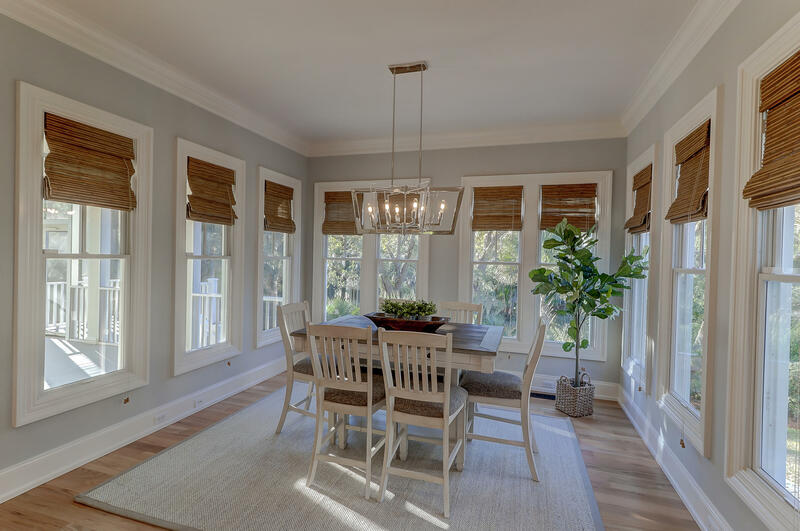 The kitchen is open to an eat-in dining room which is flanked with windows and marsh views. 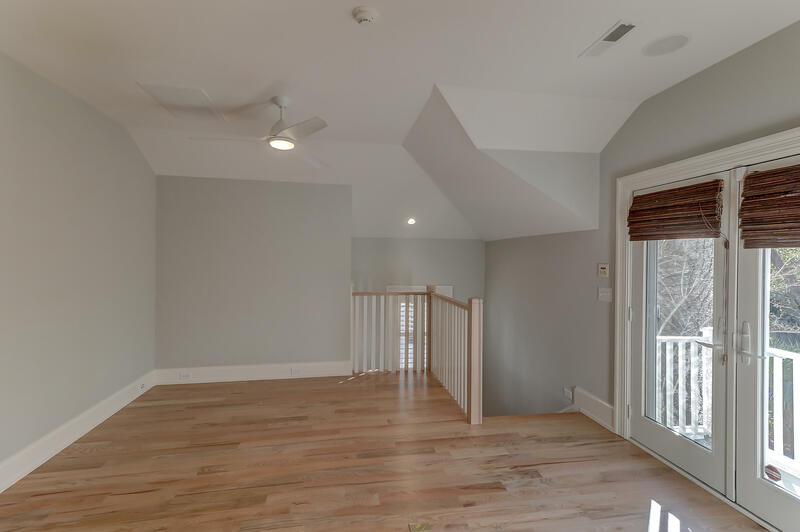 The living room has a gas fireplace and double doors leading to the back screened porch. 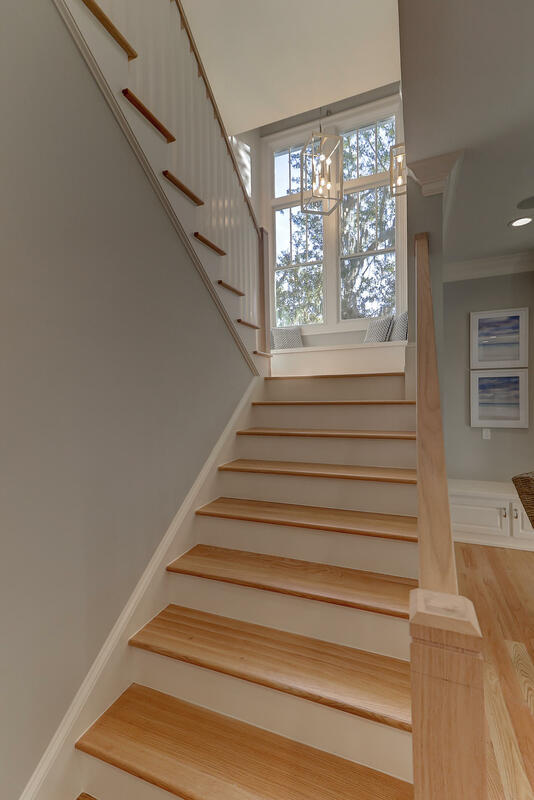 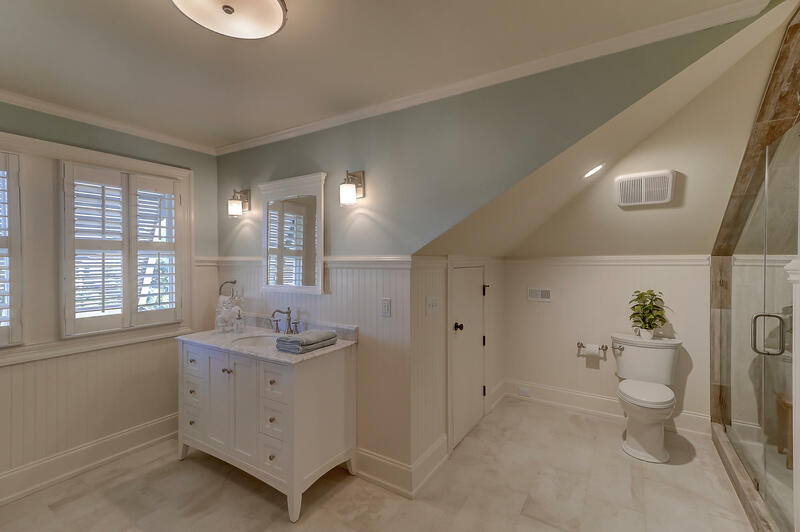 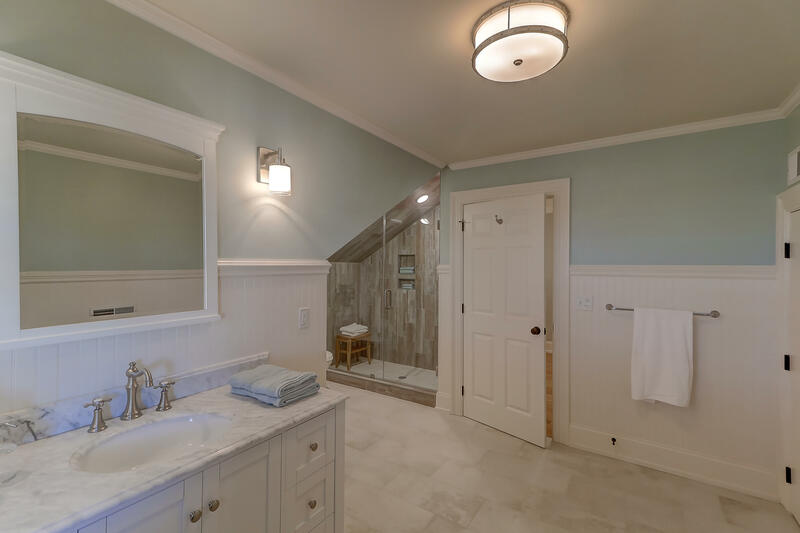 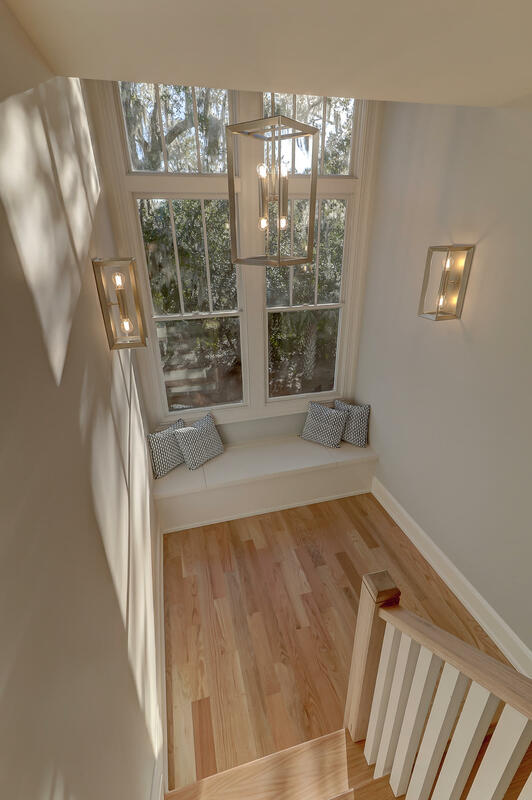 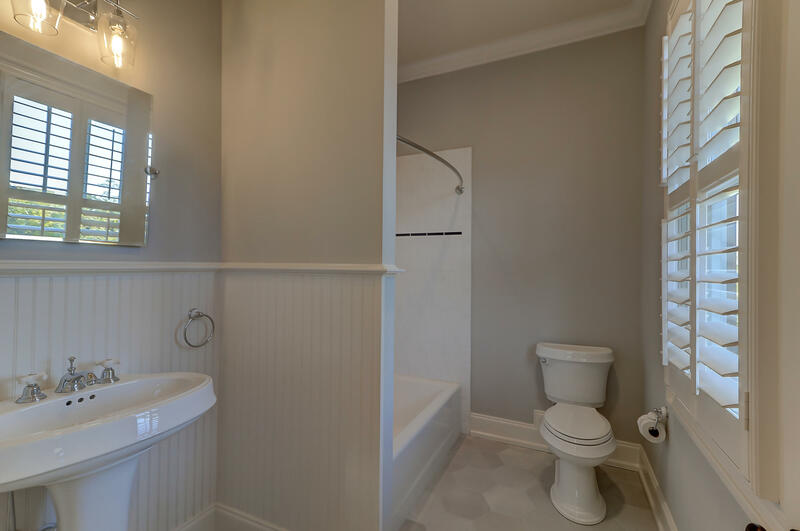 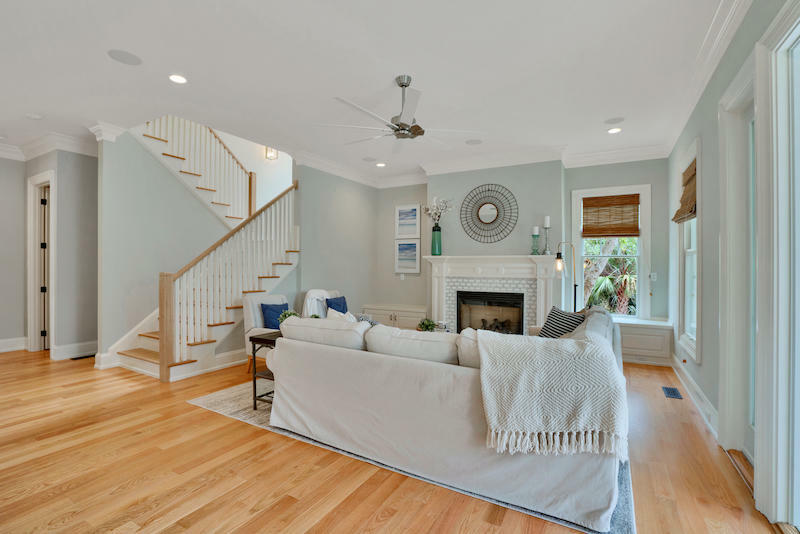 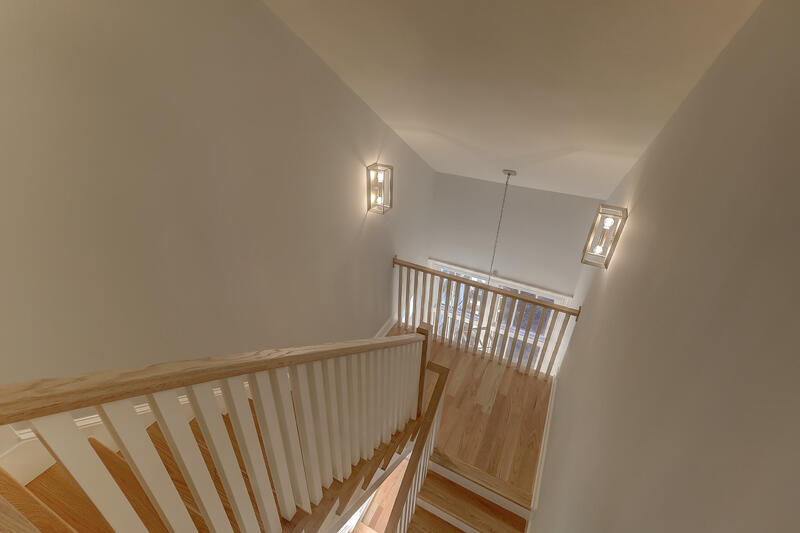 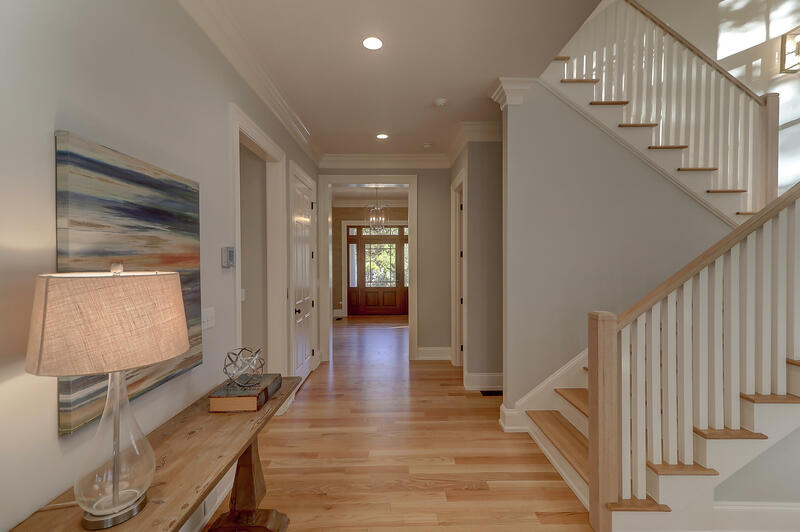 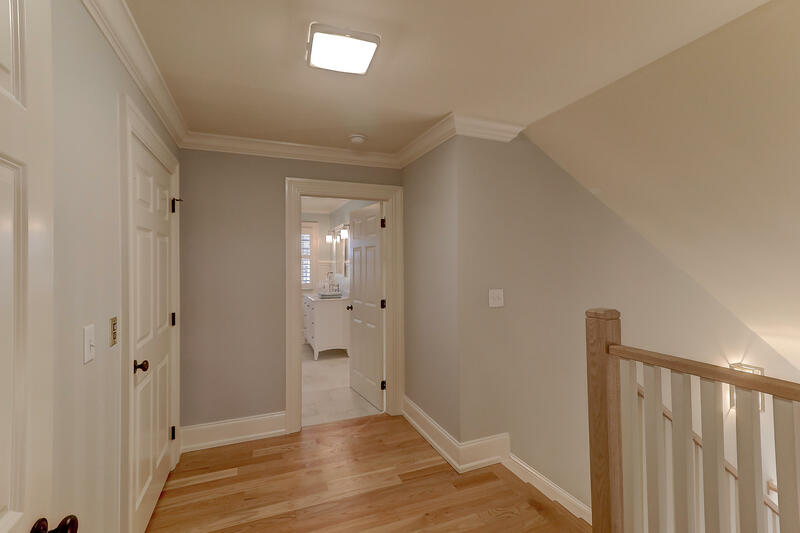 The downstairs half bath is trimmed with wood details and exquisite lighting. 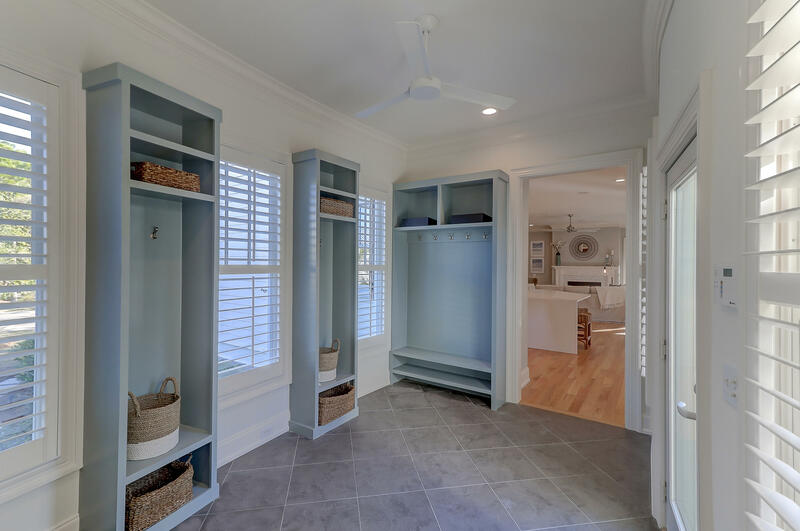 A mudroom has built in storage with convenient access to the garage and outdoors. 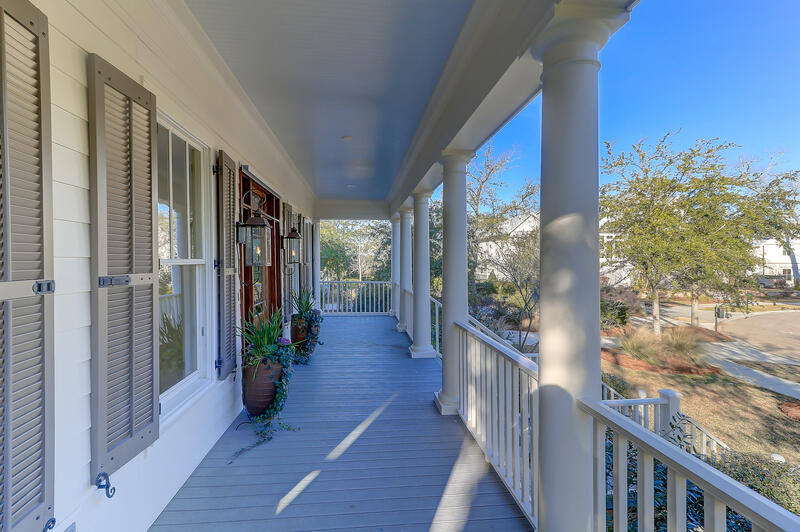 There is a large mother-in-law suite off the mud room with a full kitchen, bath, bedroom and living room, along with a private balcony. 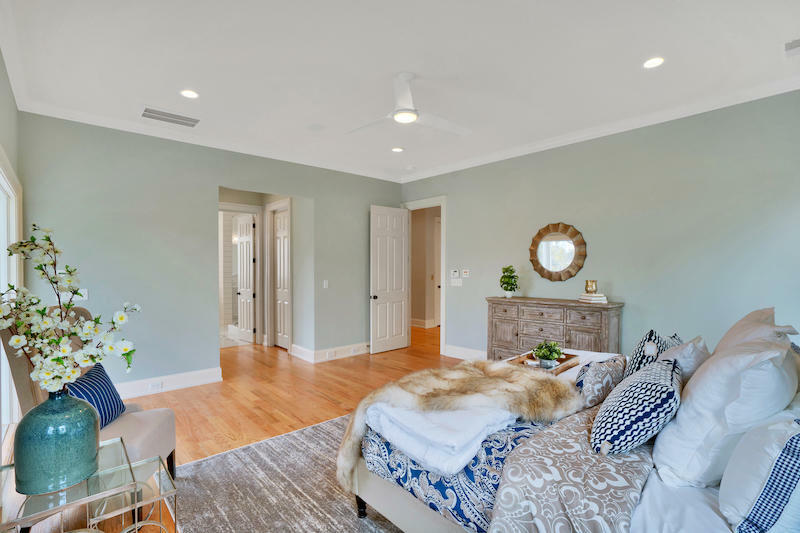 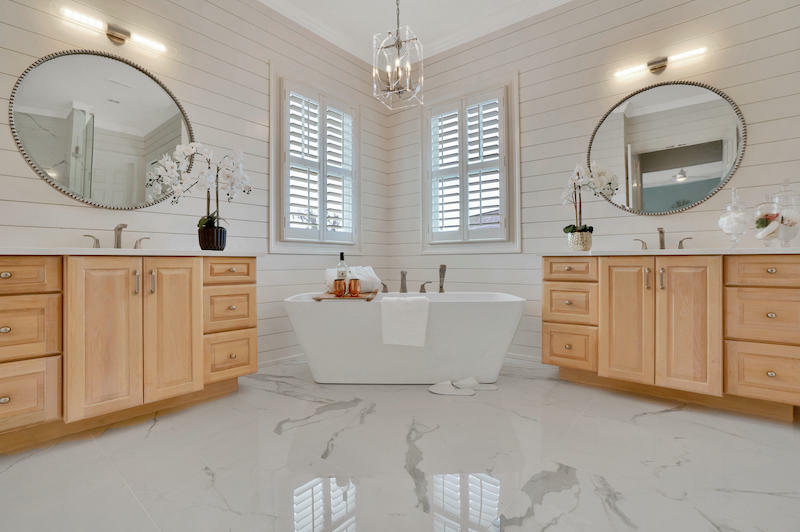 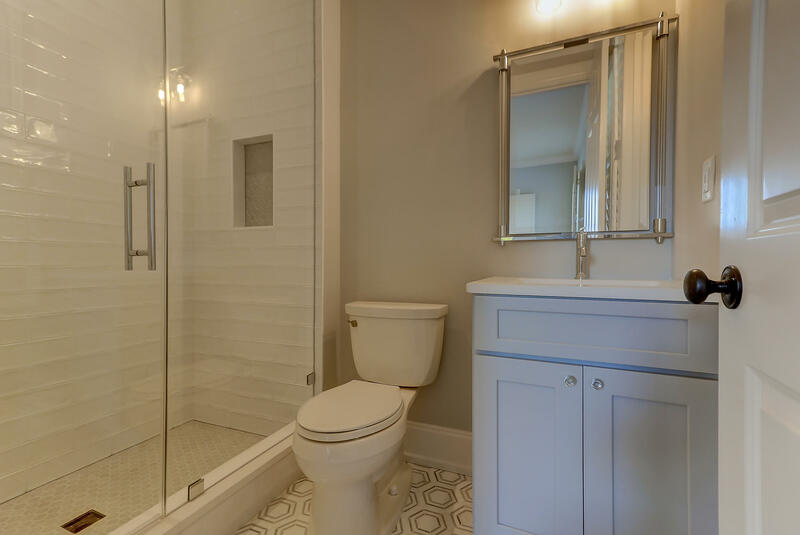 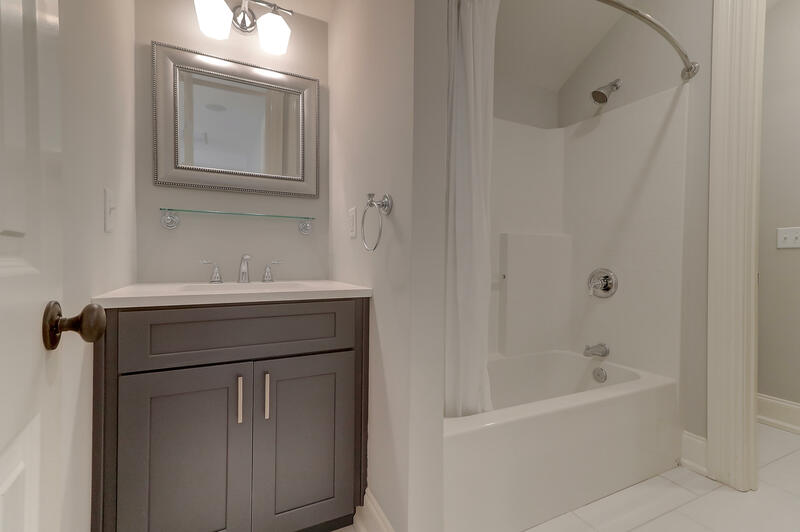 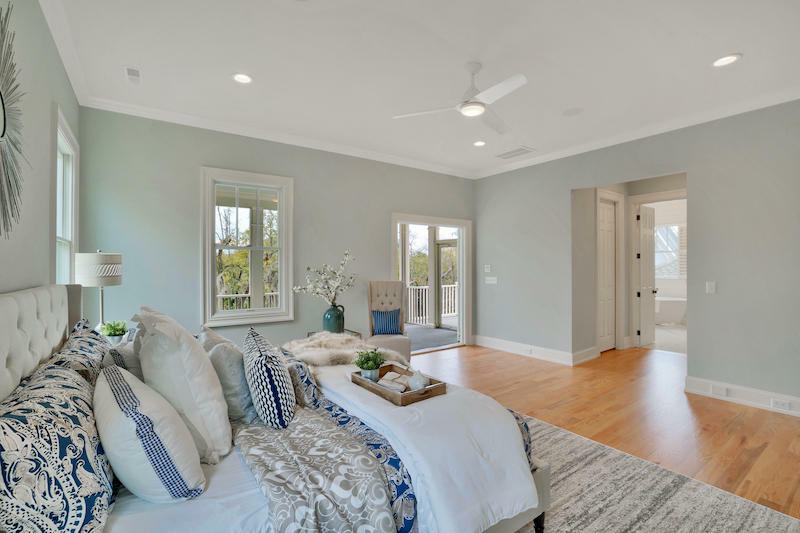 The master suite is on the second floor which also has a sprawling private balcony, dual walk in closets, dual vanities, hardwood and marble flooring, a new soaking tub and glass enclosed shower. 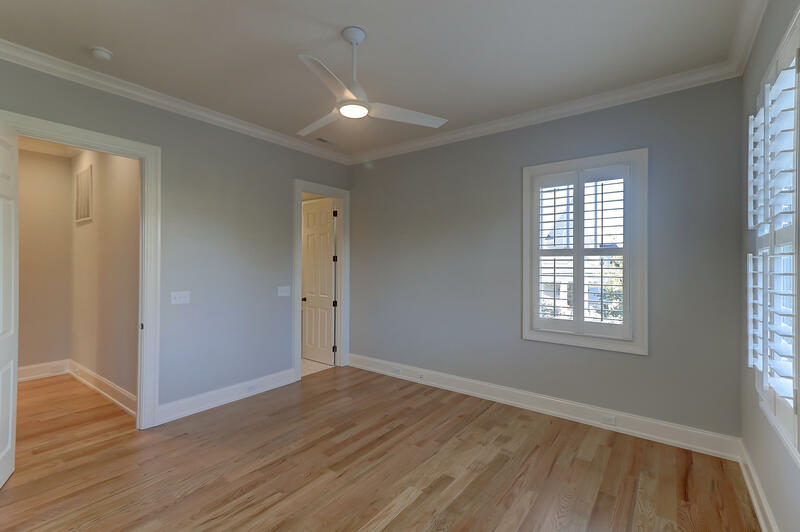 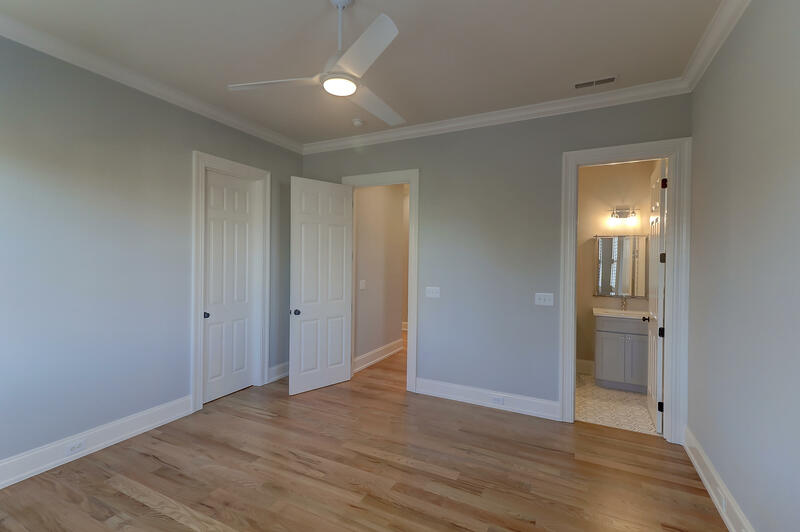 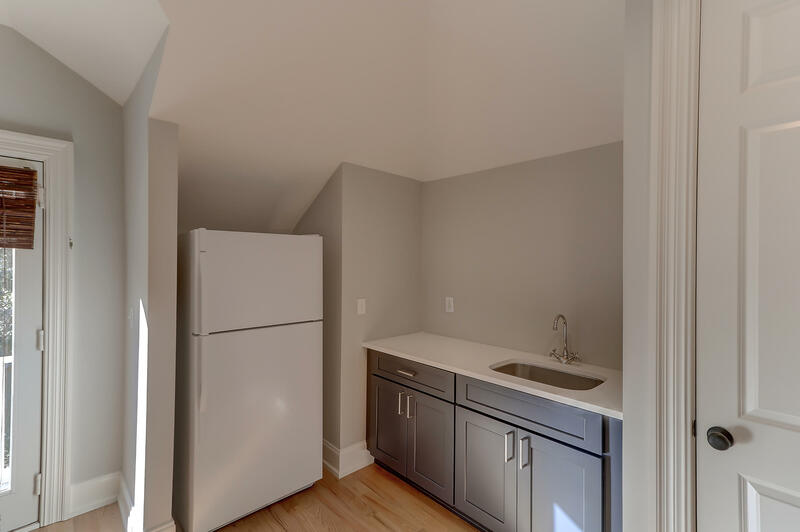 Two additional bedrooms are on the second floor, each with private bathrooms, and a laundry room. 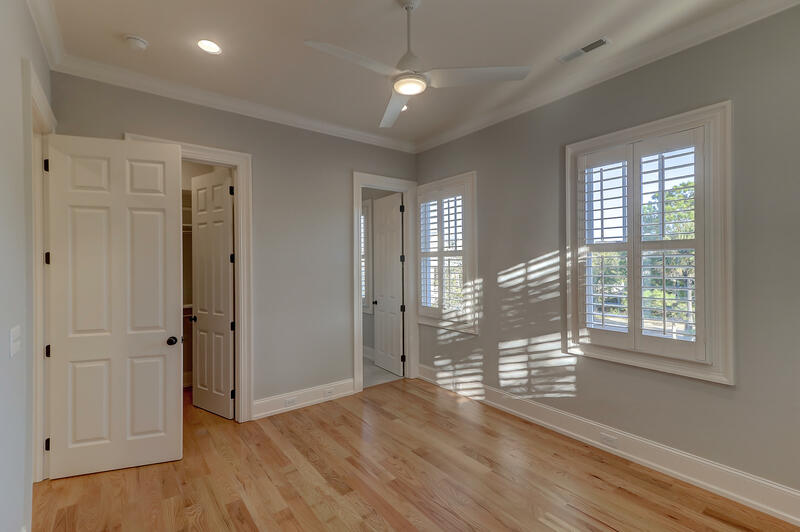 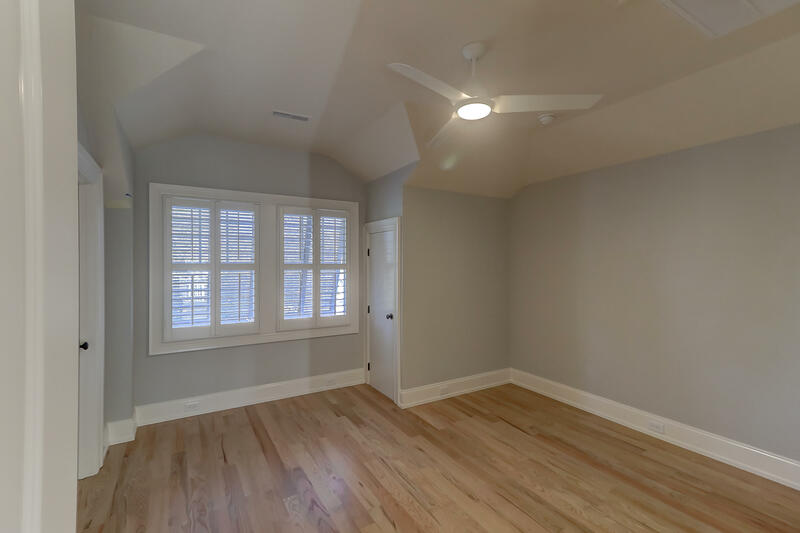 The third floor has a large bedroom/bonus room with a full bath. 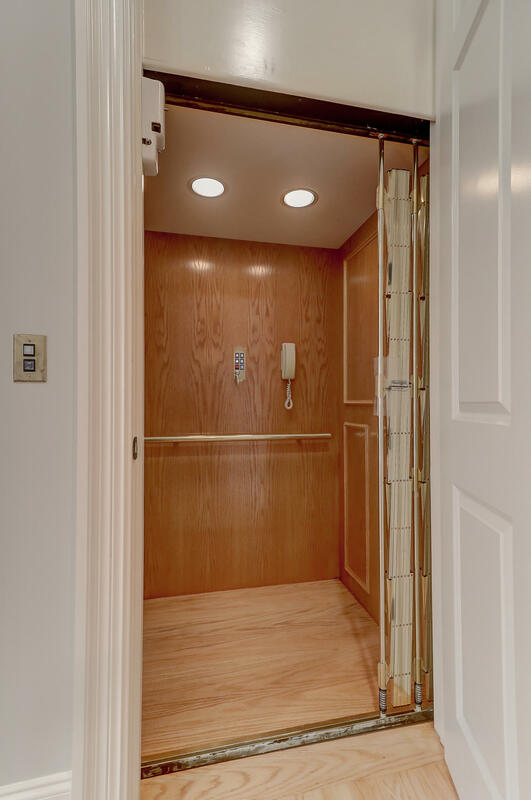 The elevator services all three floors. 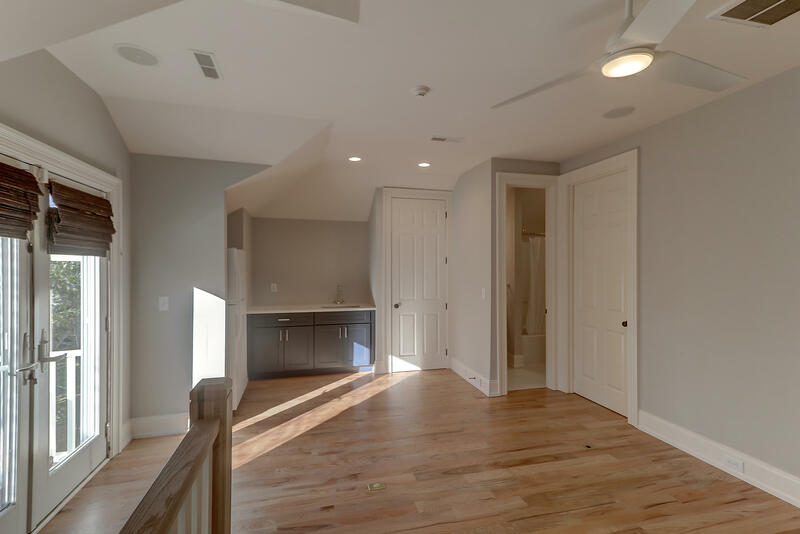 The oversized attached garage also has an additional 206 sq. 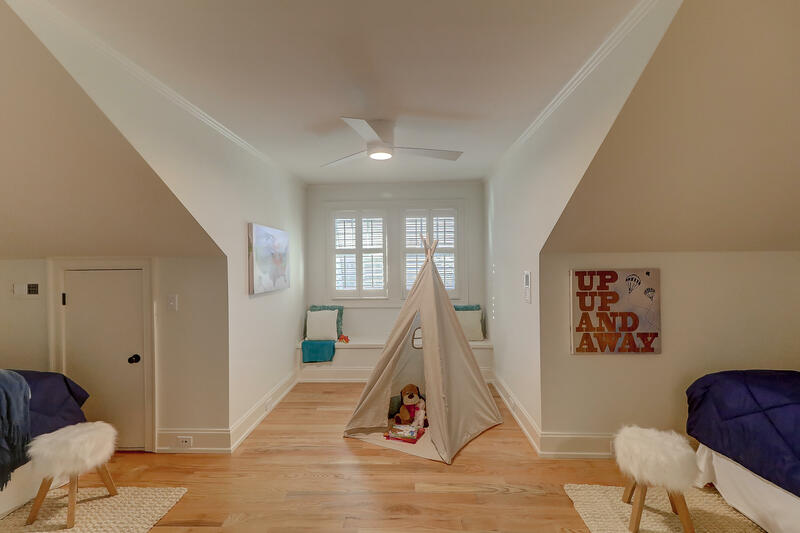 ft. climate-controlled workshop. 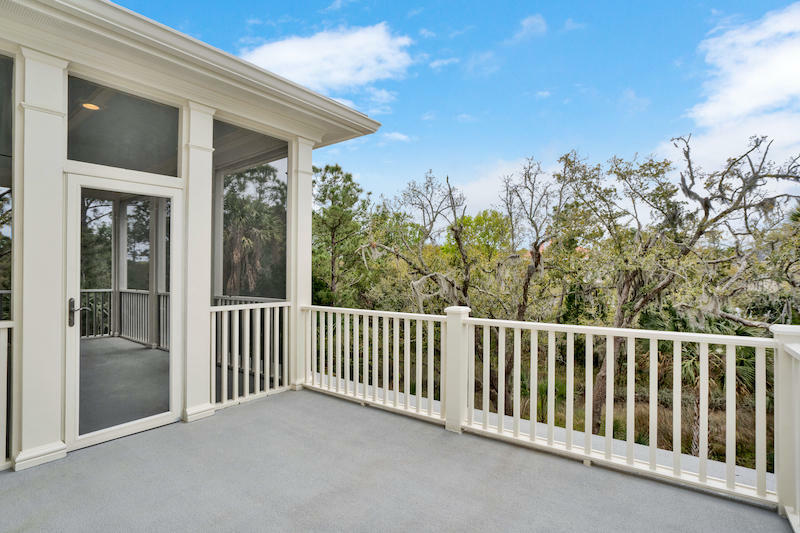 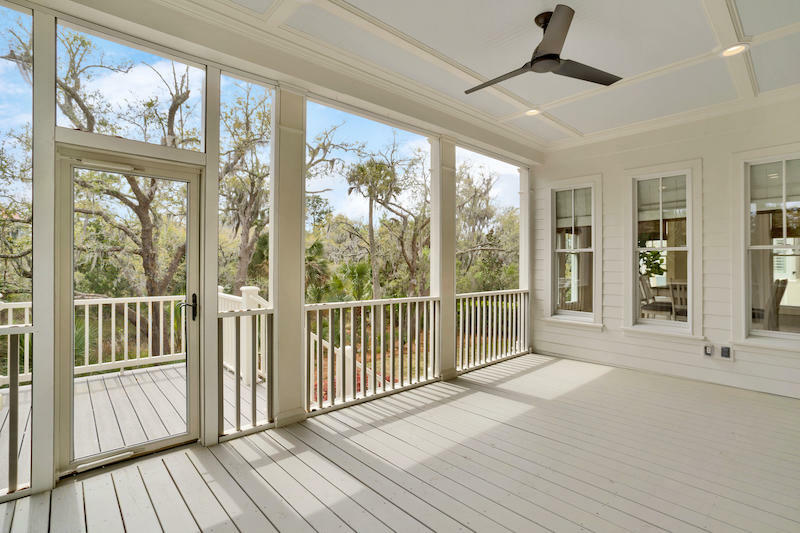 The is a large sundeck off the screened porch giving several options for outdoor dining and entertaining. 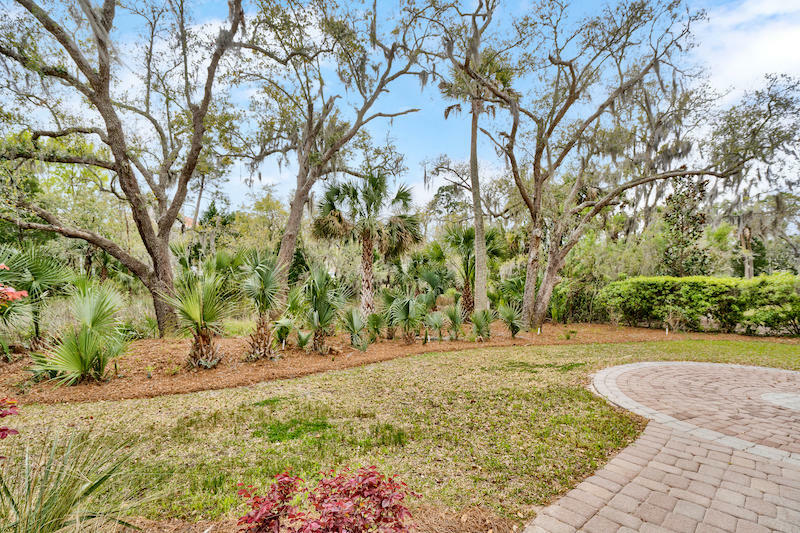 The backyard has a paver patio and plenty of room to add a pool to complete this marsh front oasis. 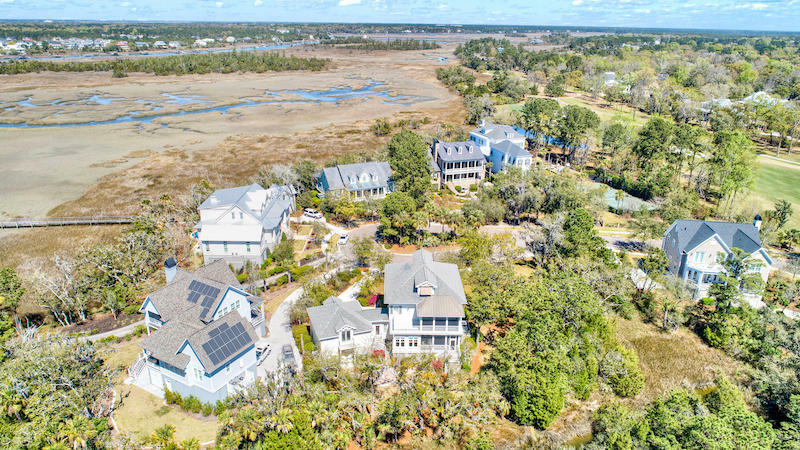 There is small tidal creek leading into Beresford Creek behind the property which is navigable by kayak or paddle board at high tide. 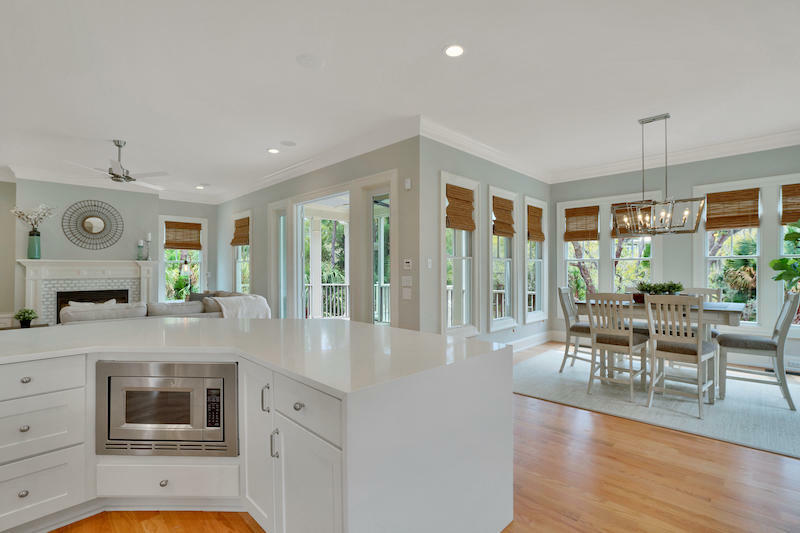 Home has a mosquito misting system, exterior architectural lighting, trex decking, hurricane shutters including windows with Lexan panel and roll down shutters, leaf guard gutters, exclusion screening under the home, Anderson windows, central vac, Inclinator elevator, two tankless hot water heaters. 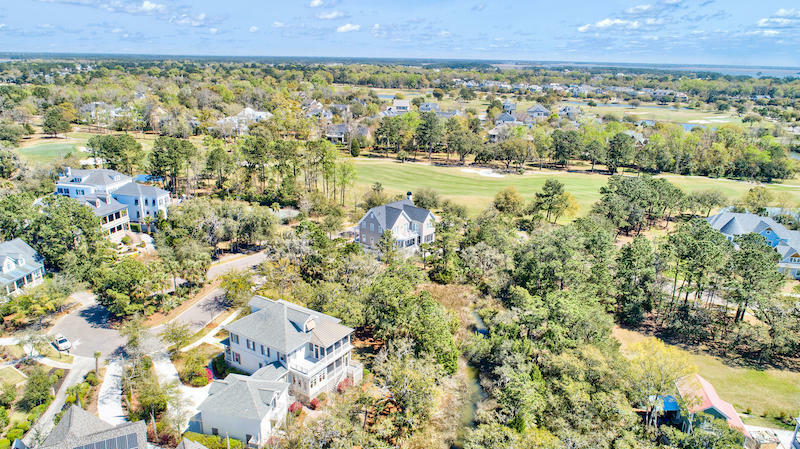 Buyer pays a one-time neighborhood enhancement fee of .5% x sales price to Daniel Island Community Fund at closing and an estoppel fee to the Daniel Island Property Owners Association, Inc. Property Disclosure, Daniel Island Resale Addendum and Community Fund Disclosure are attached. 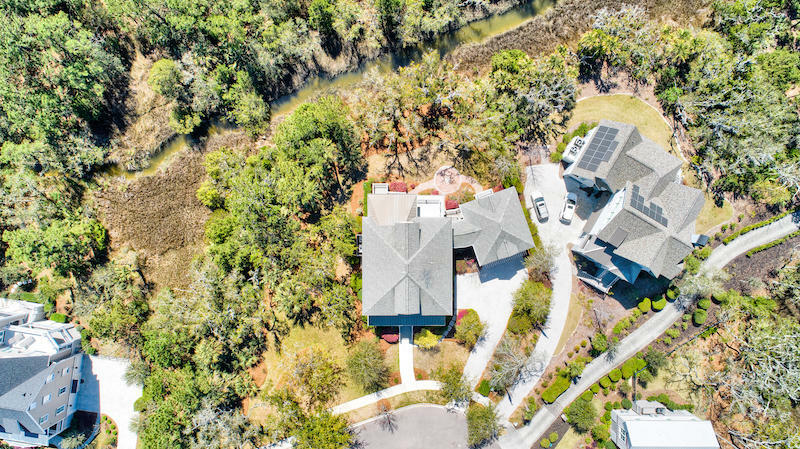 BUYER TO CONFIRM ANY INFORMATION IN THIS LISTING THAT IS IMPORTANT IN THE PURCHASE DECISION SUCH AS FEATURES, SQUARE FOOTAGE, LOT SIZE, TAXES AND SCHOOLS.